The fuel dashboard displays important information about your car's fuel consumption. This screen can be included in the car's dashboard rotation as described in the Car Settings page. There are three main lines of information displayed on this screen. The first shows the amount of fuel remaining in your car. This is displayed in the units that you have selected for your car (lbs, kg, gallons or liters). The second and third lines display different information depending on the current session. In a practice session, the second line shows the average fuel consumption per lap. This will take a few laps before any useful information is displayed, and will get progressively more accurate with each additional lap. The third item shows the best lap time of the stint. In a race session, the second line will show the amount of fuel required to finish the race. This is calculated based on your average fuel consumption per lap and the number of laps remaining in the race. It will take a few laps to read accurate information, and will become more accurate with each additional lap. 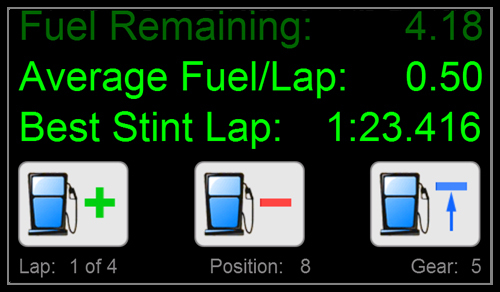 The third line displays how much fuel you will need to add at your pit stop to finish the race. For one stop races this is the amount of fuel required to finish the race minus the amount currently in your tank. It is recommended to add a bit more than this amount to prevent you from running out as you cross the line. Below the three lines of text are three fuel icons. These icons only work with iRacing. The add fuel icon on the left will increase the amount of fuel to be added at your next stop by one liter each time you press it. The remove fuel icon in the middle will decrease the amount of fuel to be added at your next stop by one liter each time you press it. If you have 10 gallons in your tank and need 12 to finish, pressing this button will set the amount to add to the lowest number of fuel greater than 2 gallons (plus the three liter buffer). If you have 10 gallons in your tank and need 8 to finish, then pressing this button will set the amount to add to zero. If you need 50 gallons to finish and you have 10 in your tank, and your tank only hold 15 gallons, then pressing this button will set the amount to add to 15 gallons.